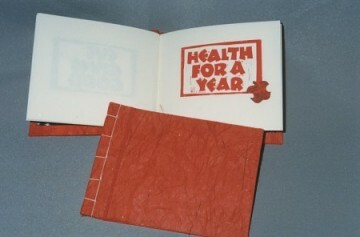 The pages were done with linoleum block cuts. The first page and the colophon were done with a Mitchell nib & gouache. It is a Japanese binding and I used a Japanese paper. Linen thread was used for the sewing and the decorative paper inside the covers was some acid free paper that I found in the memory-book section of the stamp store. Book 4½" x 5-5/8" (14.4cm x 14cm).